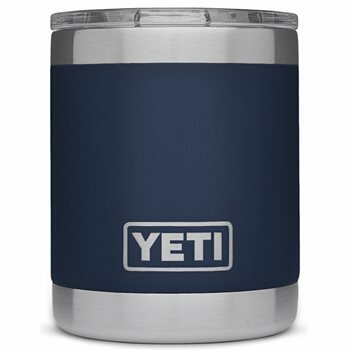 The YETI Rambler 10oz Lowball features a double-wall vacuum insulation to keep your hot drinks hot and your cold drinks cold for longer than standard mugs or cocktail glasses which makes it the perfect all-day drinking buddy. Made with durable kitchen-grade 18/8 stainless steel and a No Sweat Design, the lowball will never shatter on impact or leave a ring on your coffee table. Holds ice for very long. Great for rocks spirits. Every Morning, I sit on my back porch and enjoy a cup of coffee, this keeps it hot until the last drop. Every night I enjoy a scotch/ice and this keeps it cold until the last drop. I love it and really glad I bought it. Works really well but I had to buy a lid seperatly.